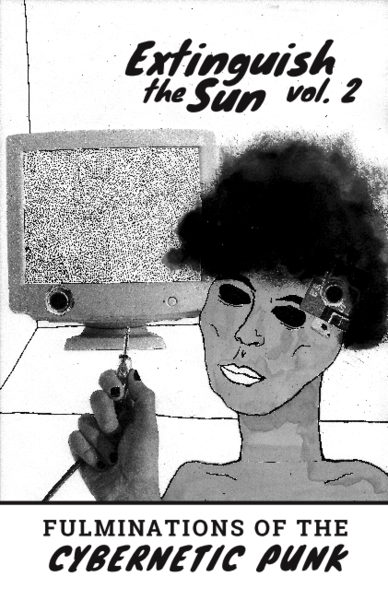 This is the second issue of Extinguish the Sun, the OSR zine. This issue contains a retro cyberpunk reskin for Lamentations of the Flame Princess, including the Cyborg, the Lowlife, the Mercenary, and the Phreak classes, as well as equipment and a description of the Matrix and the setting. It also contains an interview with Daniel Sell of the Melsonian Arts Council (Troika!, Fever Swamp, Crypts of Indormancy, Undercroft). The cover is by Anxy, the interior artwork is by Evlyn M., layout is by David Shugars and it was written by Chance Phillips. Additional writing was done by FM Geist.